How Can Guest Checkout Benefits Businesses? The Magento 2 Guest Checkout - Checkout as Guest feature in OneStep Checkout M2 is a unique and effective solution for any e-commerce stores. 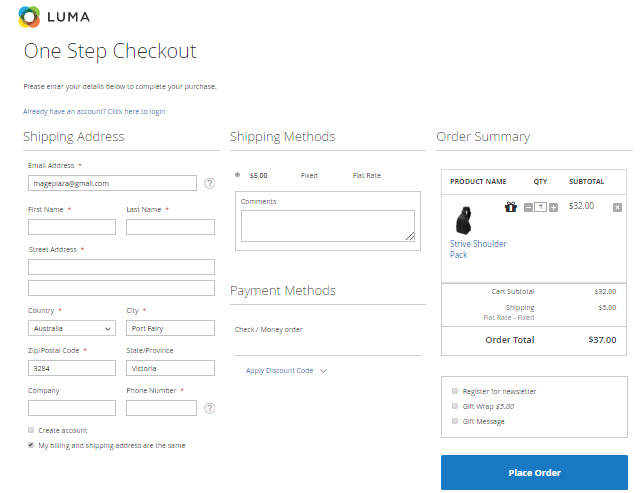 With this feature added to your checkout step, not thing can deter you and your goal in conversion rate. While customers have various pages to shop and every single page require them to register or log in, it will lead to forgotten or weak passwords. In addition, no one wants to create too many accounts and never use it. With Guest Checkout, registration will not be needed as long as buyers fill sufficient information in the checkout step. The feature will take the store’s shopping experience to another level. Moreover, owners need to pay attention to the Terms and Conditions as stores need to mention special policies and view it for customers who checkout as a guest read and agree with store policy. When there are no passwords or registration requirements, buyers will quickly fill in and finish checkout in only one step. While customers take initiative in buying processes, they would prefer the procedure to be as fast and easy as possible. Therefore, limiting the number of clicks and the loading process will be more ideal. Erasing the barrier will reduce the number of visitors who abandon their cart because of the time-consuming checkout procedure. The professional method for guest to purchase without an account will be a beneficial way to lure new customers to come and experience your products. When new customers come to the store and have their first attempt to buy a product, stores should not require customers signing up right away. It will show that you just hurry to turn them into loyal customers. Also, they still unable to trust your store enough to share their personal information or it is just a bothersome and time wasting task to do. As a result, the registered procedure can become a barrier to achieve the conversion rate. Without any requirement to login, it will help shoppers to be more comfortable to make their purchase. The feature will directly display the checkout page without any popup that force customers to signup or register exactly like the picture below. It is better for customers to create account after checkout to keep them coming back to the store regularly. The feature provides the offer to create an account during the checkout process in minutes. And then enable it the Allow Guest Checkout field: Select “Yes” to allow checking out as a guest. Moreover, guests can create an account on the checkout page without repeating to type in information. Customer will just have to tick on the box “create account” situated in the shipping address box and then form a password to finish the register instantly. After customers finish adding the shipping information, they will see the tick box to create the account. 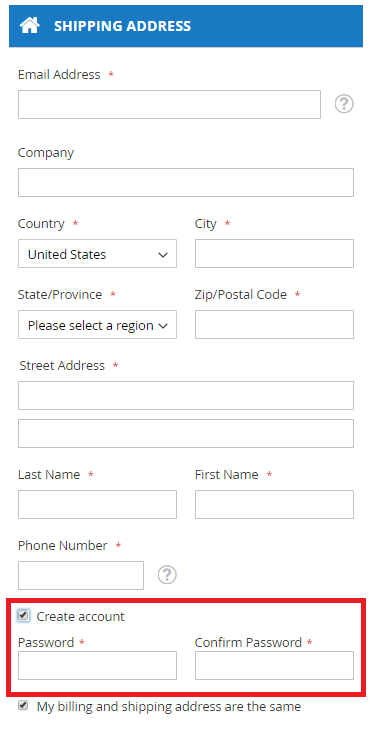 Buyers can choose to ignore or carry on to select the box to fill in a password creating field and a password confirmation field to successfully create an account without any further requirement to rewrite the personal information.